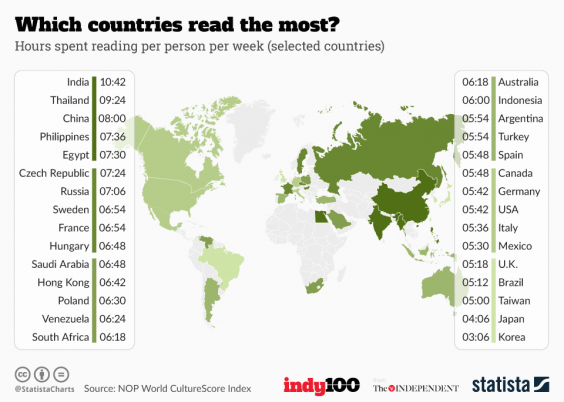 The research found that people in the UK and the US read below the global average (just over five hours a week for both), as the below chart by Statista shows. This study was done in 2005, with NOP’s Culture Score Media Habits index. I wrote before on this subject here. Reading is linked to literacy. Literacy is needed for progress. This entry was posted in Analytics, data analytics, big data, big data analytics, data on the internet, data analytics meaning, Data Analysis and Visualization and tagged global literacy rates, reading, reading nations, world population statistics. Bookmark the permalink.